Not only is Friday April 1st (and we'll be punking you with all sort of hilarious blog posts and tweets), it's also the first podcast of the month and you all know what that means! Friday Questions! That's right kids! Friday Questions! Post your questions for us to answer on the podcast and we'll do our best to answer the most interesting ones. Remember, only one question per-comment and try to keep the questions short and succinct. We glaze over reading too much text. Please try and ask questions that haven't been answered before. We're giving style points for unique, but relevant questions. UPDATE We've cut off Friday Questions. What's the secret of Monkey Island™? what is your position on aspect ratio. will the game be classic 4by3 or 16by9. i would love a 21by9 mode for perfect emersion. Here in the image I've posted maybe the content is out of focus, because the hosting site shows the image bigger than the original, which is perfectly focused and sharp. Hopefully this is not a question in bad taste or too off topic, but are you excited that Day of the Tentacle has been remastered and re-released so that a generation of gamers (like yours truly) can finally legally buy and play it on newer computers? I was a big Maniac Mansion fan (NES version) but this is the first time I have been able to play DOTT and I am excited and it just drives my thirst for more 2D adventure games. What should we do once the game is done? I caught myself listening to the 'cast and almost wishing you'd run late so I'd get more podcast. Turn your computer off and go to sleep! Will there be an ending sequence, a cutscene with a climactic reveal, swelling brass sections, possibly a timpani and more parallax scrolling, perhaps even some storytelling? Or will there be elevator music and scrolling credits? Could we have a motorcycle into play - to use Kickstarter in this way! With the re-release of "Day of the Tentacle", have you thought about a remake of "Maniac Mansion"? I love that you can still go into Ed's room and use the computer there to play the original Maniac Mansion. Even in the Special Edition. There is a group called "LucasFan Games" which created, in 2004, a completely rewritten version of Maniac Mansion, called "Maniac Mansion Deluxe", that is *exactly* a replica of the original Maniac Mansion. What do you mean? An African or a European? Will any of your pets make cameo appearances in the game? I've recently finished playing the re-release of Day of the Tentacle and I was very impressed with the UI. Have you guys seen and/or experience it? What do you think? Any ideas that you might consider implementing in TP? Thank you! Yes the classic UI is great.... or... did you mean something else? - After showing the verbs the mouse is moved to default verb and/or you move to your desired verb. Afterwards the mouse cursor location is not reset to its original location (the clicked object) which I'd prefer. - The shown verbs depend on the context, but I didn't like that the same verbs aren't at the some location for every object (e.g. 'Look at' always up etc.). - When using touch you have to hold down a short amount of time before the verbs popup (to differentiate between 'Walk to' and the verb wheel) -> I'd prefer showing it immediately. - No proper pause functionality (booo!). It might have been discussed at length so forgive me, I didn't see any of it: it strikes me how tremendously important music was to all the classic point and click adventures from Lucas Arts. The atmosphere benefited greatly from all those classic tunes. What is your plan for music (and sfx in general) on thimbleweed park? Fit the retro esthetics? Go full orchestral? Have you already decided who to collaborate with and what's most important for you in that regard? How soon into/after a project do you start thinking about the next project? From the script writer standpoint what is the biggest difference (other than syntax) between Squirrel and Scumm? Which language features do you miss of Scumm and viceversa, which Squirrel feature you couldn't live now without? Is the game engine you created going to be open sourced? As for the development of the Xbox port vs PC/MAC, has the Xbox presented any limitations to the development other than the input method? The game does not seem to be very graphic or cpu intensive (and the Xbox is a generous machine in terms of resources), I was curious if there was anything you had to be careful with when developing for the Xbox or if you had no limitations/constraints at all. Will TP have a satisfying ending? I hope the ending wasn't an afterthought! Sub-question: Ron, do you regret the ending of MI2? Bonus-question: do you regret the abbreviation for this game is TP? To me the ending for Monkey2 was one of the best ending ever. I never saw it coming. There have been made thousands and thosuands of video games with similiar number of endings. How many of those do you remember? And is Monkey2 not on that list? I really dislike ending that you can predict. Though I loved Monkey Island 3, it did have a way too predictable ending. I love the ending of Monkey Island 2 for the same reason. It is like stand up comedy. If I see the joke a mile away it is not as funny, compared to a totally unpredictable punchline and outcome. The ending of MI2 is among the best game endings ever for me. Really weird, thoroughly mysterious. Adventure games are about storytelling and telling stories shouldn't be about holding your hand and telling you that it's all going to be ok, nothing unexpected will happen. Bioshock Infinite had an ending that left my head reeling for days. In a very good way. It's endings like that that will stay with you for a long time. Have others had trouble with uploading their audio file for the phone book? I uploaded it, and played it imediadly and it was blank. No sound. I re-uploaded it and I could hear my recording. Does this mean there can be trouble with uploading, or is it just me who needs to patience, and wait at least 10 seconds for your website to compress and such? Can Gary, David and Ron record an alternative audio track for the voices? Any possibility to include a Rube Goldberg machine in the game? What's that? Too late? No, you silly, of course it's not. Ahah, that would be great! Maybe as a part of a puzzle! Let me make a huge -but I hope interesting- OFF TOPIC. The useless machines were the opposite of a Rube Goldberg machine: the latter is a very complicated machine that performs a simple task. The first is a very simple machine that performs a very complicated task: "A useless machine that does not represent anything is the perfect device by means of which we can easily revive our imagination, daily afflicted by useful machines". Every machine had a very long, precise and funny detailed description. I hope you liked the work of this genius, and maybe you could be curious to discover more of his works (very famus are the "forchette di Munari". Check them out. For puzzles which need to be solved by a specific character, how do you help a player who tries the action unsuccessfully with the wrong character understand that the action is sound, just not with this character? I guess you put some thought into this since otherwise players might be thrown off a correct trail. Hi guys, an old Lucasfilm game question: Were anyone of you involved with The Eidolon (guessing on Gary) and do you know who designed the totally awesome cover-art for the game? What is your favorite retro game that you still play, and what keeps you going back? I love adventure games that are non-linear in their storytelling, because when I get stuck, I can just try to solve one of the other riddles. Some game designers instead force you to solve puzzles in a particular order (so you don't get bits of story out of order). Where do you fall on that spectrum? If you're on the non-linear end of the spectrum, are there any tricks you employ to make it easier to tell a story nonlinearly? When I have an idea for a plot for a game, I always find I can't really make it interesting nonlinearly. In short: How do you approach coming up with a new story, and how do you make it nonlinear? Do you add B and C and D plots onto one core linear story? Or is there a better way? Is there a chance to have some date related easter eggs in game? Example.. on November 1st on certain location you can talk to many calavera or something in that style..
Oh, and one more: How expensive is hiring voice actors for a game? So many MMOs are only partially voice-acted, and I wonder if that is a cost question, or if it's just because it's easier to schedule game development and make last-minute fixes to dialog if you don't have to freeze everything in the end to record the voices. In your opinions... Which is best for old adventure games, scummvm or dosbox? Can you advise when those of us rich enough to pledge twice, yet stupid enough to pledge with the same email address will get their second chance to provide their second witty and ageless answerphone message as per our pledge? Can you give some more detail on your plans for pixel-retro™ mode? * Will there be limitations? * Do you think it will be hard to implement? * Any concrete ideas on how it will be implemented? Hmmn, My bullet points went *bold* Sorry! Didn't know you could do that. is there a way you know of to prove (in a mathematical fashion), that an adventuere game will not have dead ends (unlike MM, oops I didn't say that). Will you release a full, uncensored version of the puzzle dependency chart at some point? Good question. I think he said that in the past he often stopped updating it at some point. But if he *really* wants to ensure there are no dead ends maybe he kept it up-to-date this time? Maybe just for the sake of this blog! I've been playing Doublefine's DOTT remaster, which contains the DOSV2 version of Maniac Mansion, and I've been enjoying replaying it. However, there has never been a true "definitive" version of MM - the NES version is censored, needs a joypad and lacks the great DOSV2 art, while the DOSV2 version lacks George Sanger's fantastic NES music and requires use of the clunky "what is" command, and both versions have multiple deadends. I believe Ron's said in the past he's not in favour of remasters, but have you ever considered a version that just brings the best parts of the existing ports together and eliminates all dead ends? Keep in mind that Ron Gilbert doesn't own Maniac Mansion; Disney does. Are you then asking if he'd be open to a definitive version if Disney gives the greenlight? To the team, except Ron: By any chance... has Ron changed back to the original 80s Ron during the past 1.5 years? I mean, point&click is HIS thing, his home... As if point&click (+ its many fans) is the best cure ever... Did it change you as well, team? Maybe 80's Ron Gilbert never went away…he just couldn't make a Lucasarts-esque Adventure game until recently. Are you still happy with the decision to use squirrel as the scripting language? Will the "Look at" command result it a different response if you do it several times on the same object? I've have played to recent adventure games. And it really annoys me that I can "Look at" an object two or three times and get a more and more detailed response every time. Blasphemy! Thwow him to the floor! Does live have a meaning or purpose? Or do we just go on doing stuff and that's it? My question would be: have you ever played monkey Island 3 and if so did you like it? Have you received some useful feedback in regard to your new alternative game controller mode? Will your next game, subsequent to TP, feature pixel art as well, if it's going to be based on the same engine? If you were early in your game career TODAY, would you be creating Thimbleweed Park, or would you be doing something else? And if you wouldn't be doing point-n-clicks, what genre would you be doing? Before releasing a game you probably have an overall feeling on how successful it is going to be. Is this feeling generally accurate or are there often some big surprises (positive or negative)? If Thimbleweed does well, do you guys think you'll make more "scummy" games? The feedback for the game is in general really good. Can you imagine to do another Point and Click Adventure in the Team Gilbert/ Fox/ Winnick/ Ferrari (and the new faces). I hope that I can say that I speak for the most of the fans, that the thing you are doing is incredible and we all hope for new games in this Art & Style. 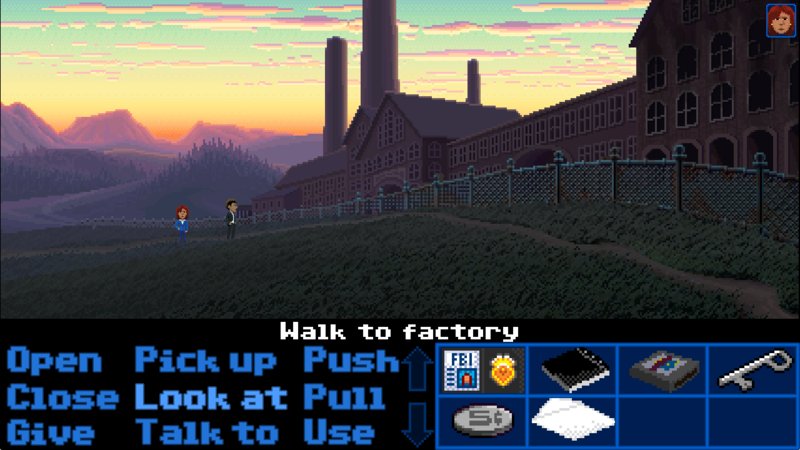 Will Thimbleweed Park come to the PS4, if so when? What was the most unusual interview question you were asked during GDC and what was the most stupid one? I recall that Ron said that the EGA version of MI is the definitive one, but what is the definitive Maniac Mansion and Zak? Is it the C64 versions or is it the CGA composite versions or something else? Don't know about MM but I reckon the best version of Zak is the FM Towns version. Did you meet any interviewers you really disliked during GDC and, if so, how did you handle them? Did you guys ever end up using Spine for the character animations? Can you please give me detailed information about how Ransome's swear jar will work in the game? Yup, I'd be interested in that as well! If Gary was a ghost, would that make finishing the game harder? I am your nemesis, David Fox, and I'm eager for revenge. and I'm about to fire it on your friends Ron & Gary. My circuits are now quantum-encrypted, with a 5-digits password based on the uncertainty principle. Now answer this: will you guess this unguessable password, maybe, set your friends free, and destroy me again? Ron/Malcom, would you be willing to do tutorials on the algorithms/other code stuff specific to Point and Click Adventures (e.g. Walkboxes)? I tagged Malcom because I remember reading something about him writing the walkbox code. I just wondered when we will have the opportunity to upload our phone box message and whether we should wait to be contacted for this? 1) is there a specifice date when the game is set? Will it be possible to add voice acting done in other languages by fan actors? Hmmm... let me guess... if you answer "yes", considering that it will be possible for users to change the text of the game, then it would be tecnically possible to eventually see Monkey Island 3a under a cover name!!! (Thanks to Arto for the suggestion on Grumpy Gamer). Ron, have you ever thought about this possibility? Cover name: The Treasure of Money Island!!! I'm just joking, keep on working on new ideas, Disney cares too much about money, they could make a real "movie" with Star Wars but they only thought how to put new clothes on a well selling miniature figure. Will it be possible to make some kind of (skippable) intro when you start your savegame, like "Last time on Thimbleweed Park...", and then it recaps some of the major moments so you are back up to speed? I actually like this idea a lot!! Will you succeed in answering THIS question WITHOUT using one of your previous answers? Could you give a few examples of games that got the puzzles right? Whatever "right" means. I have literally just finished Tales of MI an hour ago and have enjoyed playing it more than I had expected (being 3D and verb-less). You are credited on every episode as "visiting professor of Monkeyology". What was your exact involvement: story, puzzles, dialogues, loose ideas? Did you play the game yourself and if so, what did you like and what didn't you like? Now it is on to my first visit to the CAVE! By the time I'll finish that one, I can probably start playing TP... Yay! Other than Boris for German, how will you go about localizing the game in other languages? Are you sending it to an agency or are you planning on using a team of freelancers? What was the inspiration for the talking dog in the Scumm Bar and who's the brain behind it? I'd like to know this too. It appears so early in the game, I remember first playing it and talking to the dog make me realise (in between uncontrollable bouts of laughter) I was playing something very special. I still quote the dog to this day. "Aruf-ruf, LeChuck! Grrrrr"
And why was the closeup cut? I guess it's because you needed to save disk space... But why was Spiffy's snout on the box? I bought the game because of that snout! (not really). Did you receive more or less money from the up- pledges than you thought you would. If possible, how much extra money did you get? I you could send yourself a tweet (140 characters or less) back in time to the beginning stages of Thimbleweed Park's conceptualisation, what would it be? Will anything you've built so far to make the game make it significantly easier for you to create another classic adventure in the future, if you guys decide you'd like to down the road? I loved the box contents in the old games such as the wonderful bulletin board in Maniac Mansion with a bunch of clues and backstory. How involved were you in the design of the physical copy protection in the old games (the code book in Zak McKracken and Maniac Mansion, and the Dial-a-Pirate code wheel in Monkey Island)? And what would the spiritual equivalent be in Thimbleweed Park if we imagine that the game was created in 1987? My brother and I were pretty blown away when Bernard tried to crack the code on the security door on his own. This was a new level of meta for us. Do you realize that you are a legend for players between 30 and 40? So the question: what is it like to be a legend still alive in the point and click of the universe? and especially ... ... confess at the outset: it was Fox Mulder and Dana Sculy characters thimbleweed? : D;) glad to see you on stage and proud to see that there is an interest of some players still in 2016 for point and click and pixel art! Best regards! Something digging perhaps with Fox for a XFILES point and click in the coming years? I'm really worried about the shipment of the game... I kickstarted the boxed version for sentimental reasons, and I'm praying the postal service won't ruin the packaging and what's inside... Can you please take all the necessary precautions for this? Do you already know how the items will be packaged? Thanks! Are you most afraid of the Italian Postal Service or the italian postmen? How about a director's commentary? After all this blog contains so much cool information, it should somehow be integrated to the game. In one of your later screenshots it looks like the pixels of the interface/inventory are bigger than the pixels of the room/background. In the same screenshot the characters, that are standing in the distance in a smaller scale seem to be drawn in even smaller pixels. Are there going to be pixels of different sizes in one screen in the final game? And if so, why? Ah, I just noticed that this was answered already in a previous podcast. Yes, but the answer can change day by day ! Yes, I see there is a need for a daily podcast, where the whole team share weather details around the globe. Forget the game, turn this thing into a weather podcast! Hi Ron, many months back you said you were still to decide whether or not Thimbleweed Park would support Windows XP. Have you made your mind up yet? I think it would be nice if people could run the game on older PCs to reinforce the feel of playing a forgotten classic adventure found in a drawer on a machine from the recent past. Why did LeChuck have a blue coat in Guybrush's "Dem Bones" vision in Monkey Island 2? Probably because at that point, Guybrush has never seen LeChuck in Zombie form, and we see the hallucination through his eyes (even though in 3rd person perspective). I'd say because a red coat on red a background lacks contrast. How has the crowd-funded game development been so far? Is it less stressful when there is full artistic control? Do you feel like you have an obligation to listen to the funders (eg. commenters on this blog) in terms of gameplay and graphics, or do you think that people can only offer suggestions, not demands? How do you create a sense of verisimiltude? With many games, playing them feels like I'm playing a videogame created by a human being. It never feels like anything in the game is real; it always feels like it's just a play put on for my personal benefit. When I play games like Monkey Island, on the other hand, it really feels like I'm catching a glimpse into a real world, inhabited by real people who have purposes and goals and desires of their own, other than just helping me along my own journey. At one point, I thought that this mainly came down to writing, but many Mario sidescrollers *do* give me a sense of reality; it *does* feel like they play in a real world. On the other hand, a game like Sunset Overdrive, which is technically a good game, and quite well written, always felt very artificial to me. So.. how do you create that sense that the game actually happens in a real place, inhabited by real people? How do you make people forget that they're playing a game designed and created by a human being? How do you create a world that allows people to lose themselves inside of it? I'd also like to hear about how this kind of immersion can be achieved. This is usually the main point for me that separates good games from the rest. A professionally designed game without immersion is nothing compared to a crappy/cheap/simple game with a great sense of immersion. Can you and will you post an overview of the tools that are used to create the game? Just to Get a feel of the scope of things. Is there any chance to get blog post about arranging the music, or even to get Mr. Kirk’s view on the process? If it's possible to answer this without spoilers, will the flashbacks make use of the "unreliable narrator" concept a bit like when Guybrush fails to escape in MI2 and dies, only for Elaine to say, "you died?!" When you are working at your computer, what food do you eat that is the most dangerous for your keyboard? What sould we call you? As a company creating games. Terrible Toybox? If we don't count buggy dead ends, I actually liked that in MM and Zak you could die or experience a setback. Get caught, go to prison, lose non-important or expendable items. The different possible fates of Sushi the fish in Zak is a very good example of that. It meant that the world is real, what I'm doing is important and real, and there are consequences for my mistakes, small, but irreversible. I know you don't consider death anymore, but do you consider some setbacks and (non game-breaking) minor loss if you do something wrong? I agree that this makes the world real and that's what I still like about those games! To Ron and Gary -- does it feel different making a game you completely own and control to making a game for someone else and do you approach it differently because it's fully your own? Do you need to sell a lot of units to consider TP a success, or has the Kickstarter campaign already made it successful in that you took in enough money to pay yourselves for a couple years to create the game? Will TERRIBLE TOYBOX become something like DOUBLEFINE? In your podcast you frequently talk about Windows, iOS, and XBox versions of your game. Can you say a few words about the Linux port (e.g., if you started to work on it yet or how complicated it will be to compile it on Linux)? Can't wait to play TWP! Will the different acts in the game and/or the flashbacks be introduced by a dedicated screen like in the Monkey Island games? I really loved those as I they helped to set the mood and made me wonder what would happen next, trying to guess from the title and the drawings. Does chuck the plant appears on TWP? After doing TP: Did you use good ideas that might have gone into a Zak sequel or another Monkey Island (which is unlikely to happen because of Disney) so that we can really get access to what might have been? How did the heap in C64 Scumm work? Did it compact/defragment its memory? How many objects could it hold? Rooms? costumes? inventory objects? Are you really THAT Ron Gilbert? My Friday questions inquiry: If a recorded answering machine message is denied by you for reason <X>, do we get a chance of correcting it/making a new one and you telling us what we did wrong? One last Friday question inquiry: "I want to be a game developer!" What are the three trials you have for me, oh you three "Important-Looking Game-Devs" (TM)? First I would like to apologize if someone else has asked these questions. 1. When working on the art, how did you decide what resolution the backdrops were going to be? Were you attempting to match the fidelity of Maniac Mansion? What kind of rules did you provide the artists to produce the work that would fit within the confines of your game aesthetic? 2. I am a lighting artist by trade, and I was more curious about your lighting system, could you explain how the 2d elements react to the system a little more? It looks very reminiscent of something from the recent revival of Shadowrun, where these 2-dimensional elements are lit sort of orthographically or I guess a better description would be projection lighting, as though you were shining a light on a layered canvas. Does it take into consideration depth? 3. From a design / story perspective, do you ever find it difficult to create something new or fresh? For me I have a somewhat decent memory for all things media related, usually when I attempt to come up with something in story or design, I find myself constantly comparing my work to the library in my head of digested material. I finished Day of the Tentacle recently and Mr. Schafer mentioned Twin Peaks in the commentary, was that a sort of inspiration for this title? As a sort of side comment, I was talking with my brother about your podcast in which you mentioned that dead ends were maybe a design situation you were trying to avoid, I was replaying Maniac Mansion recently and caused the nuclear reactor to explode, it had been ages since I had played and was pleasantly surprised, I actually enjoyed that within 20 minutes I destroyed everyone haha. Granted for a first time player I could see that being very frustrating, especially if you were going through the game very slowly. However the replay value was fairly high in Maniac Mansion with the different character selections. Which brings me to my next question, how are you handling replay-ability, with potentially no dead ends? Any chance we'll see any mini-game-style puzzles (logic/pattern/sequence/riddle puzzles)? ...you know, those outside the usual point-and-click fare (e.g. use-item-with-thing, or enter this code on a keypad). How many close-up screens for common point-and-click puzzles (like a number pad or phone book) do you estimate will be in the game? Will there be any self-contained mini-game puzzles more along the lines of those seen in Myst, 7th Guest, or the robot wire puzzle or knots puzzle in Broken Age? Any chance we'll see any mini-game-style puzzles (logic/pattern/sequence/riddle puzzles along the lines of those seen in Myst, 7th Guest, or the robot wire puzzle or knots puzzle in Broken Age)? ...you know, those outside the usual point-and-click fare (e.g. use-item-with-thing, or enter this code on a keypad). Did you have any say as to what version of Maniac Manson was put into Day of the Tentacle? Upon playing Day of the Tentacle Remastered on the PS4, I was disappointed to see that the C64 version was not used. The intro song on whatever version was used sounded quite inferior to what I remember hearing on the C64. Long live the SID! OMG. In Maniac Mansion, Syd was the musician. Was this an homage to C64's SID chip, or just coincidence? I guess it could have been a slight reference to Sid Vicious. Or Syd Barrett. @Gary : I just listened to the future podcast answering to these questions, and I was puzzled because you will say the words "dark chocolate" without any apparent reason. Will my question modify the current timeline, thus preventing you to say such words, and giving demonstration to everyone that I actually am a Time Traveller, and I have the ability to alter the past and impact on the future? @Carlo Valenti: give us evidence that you are a Time Traveller, by answering this question: a few days after the "Friday Question" podcast will be published, what will happen to those unanswered questions? They will be lost in time, like laughters in the sun. I assume that bugs can be very incalculable. Has there possibly been a bug in the game that caused you beads of perspiration, against the background of the schedule?